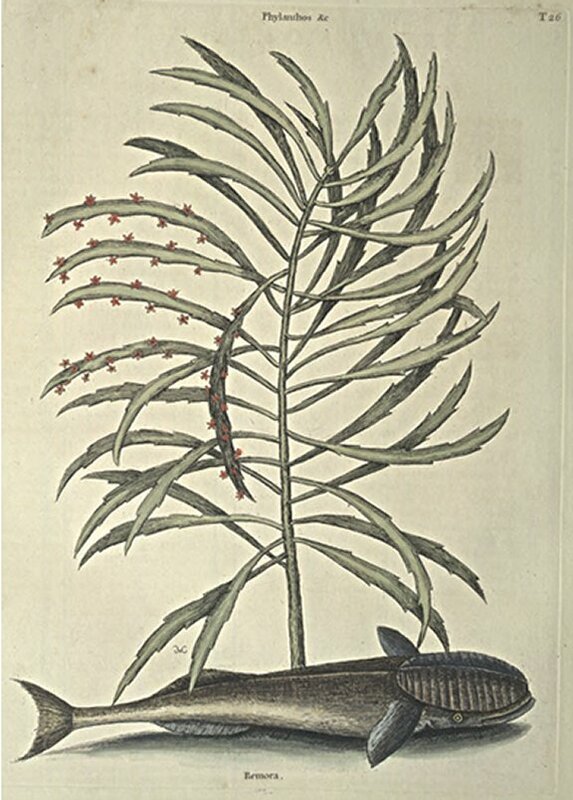 Sir Hans Sloane in his Natural History of Jamaica, seems to think it needless to describe this Fish, because (says he) it has been described and figured by most natural Historians, therefore he little more than recites the Authors that have mentioned it, with the different Names they have call'd it by; but as it has not been exhibited in its natural Colours, I hope it may not be thought improper to give it a Place here, and to add some Remarks not before observed: It is usually about a Foot in Length, the Head large, equal in Bigness to the Body, which grows smaller gradually to the Tail, which is small. It hath six Fins, two growing from behind the Gills, two more under the Throat, a long one on the Back, and opposite to it under the Belly another of the same Form and Size; the Tail forked: What this Fish hath peculiar to it self is, that the Crown of the Head is flat and of an oval Form, with a Ridge or rising, running length ways, and cross ways to this 16 Ridges with hollow Furrows between, by which Structure it can fix it self to any Animal or other Substance, as they are often found adhering to the Sides of Ships, and the Bodies of Sharks and other large Fish: But the Notion that this small Fish was able to stop a Ship under Sail or a Whale in Swimming, is entirely fabulous; all they can do is no more, than what Shells or Corals and other Foulnesses, which make her Sail somewhat the slower. I have taken five of them from off the Body of a Shark; which were fixed so fast to different Parts of his Body, that it required great Strength to separate them: I have seen them disengaged and swimming very deliberately near the Shark's Mouth, without his attempting to swallow them, the Reason of which I am not able to give. This Shrub rises to the Height of five or six Feet, with many upright Stems growing from the Root; the Leaves are usually four, and some five Inches long, having both edges serrated or widely notched, at somewhat less than an Inch distant from one another; from every of these Notches grow a very small monopetalous red Flower, succeeded by small round red Berries. They grow on many of the Bahama-Islands.